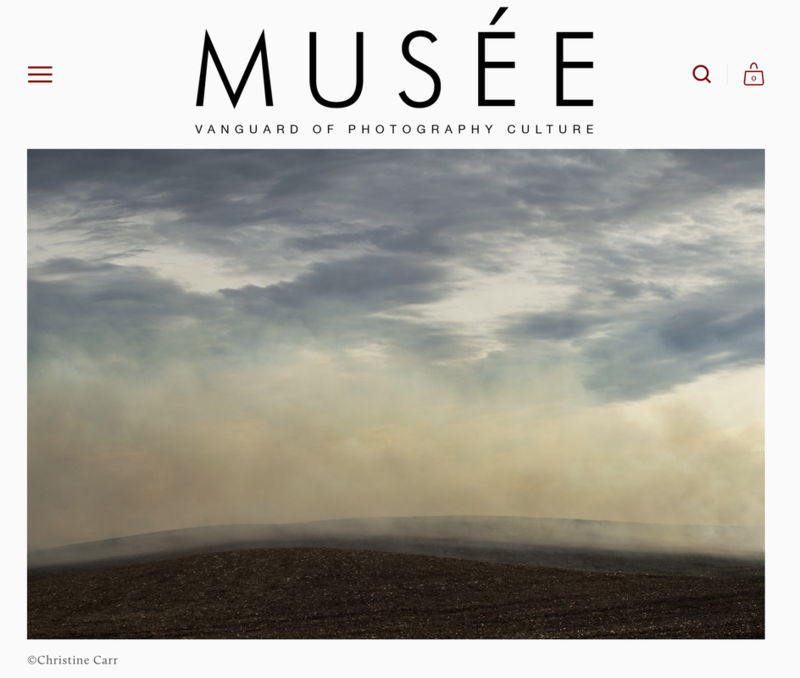 In the Air is featured in Musee Magazine! One of my images from the Monolith series is part of the Power and Beauty: Women Artists from the Collection exhibition at the Eleanor D. Wilson Museum from January 22 - February 10, 2019. 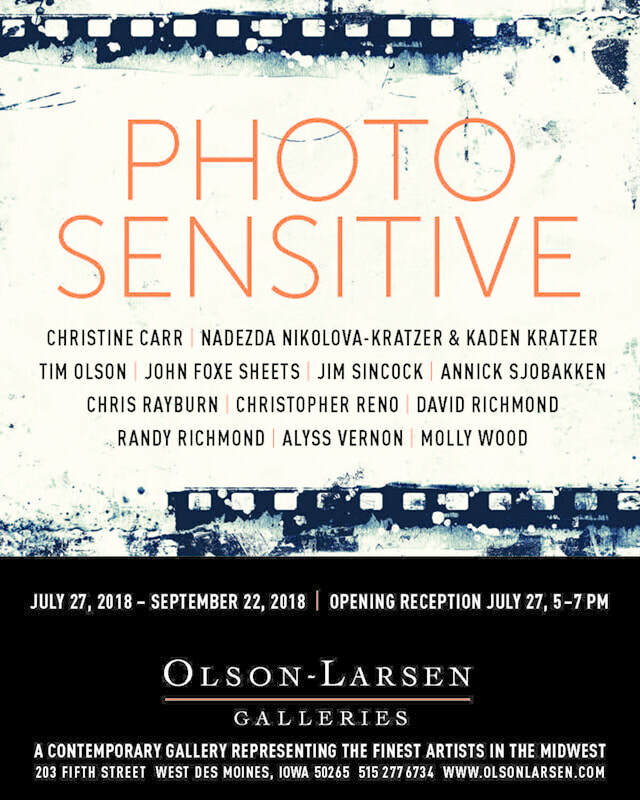 I'm delighted to announce the first solo exhibition from my In the Air project is at the Irene Carlson Gallery of Photography at The University of La Verne in La Verne, California from August 27 - October 21, 2018. 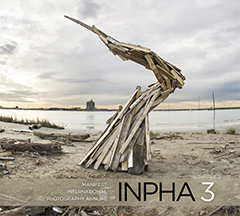 Reception: October 4, 5:30-6:30 pm, Irene Carlson Gallery of Photography. 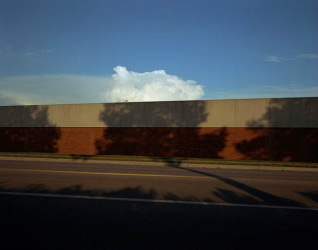 Photography Invitational at Giertz Gallery at Parkland College in Champaign, Illinois. at the Giertz Gallery from Monday, November 2, 2018 through Saturday, February 2, 2019. 1st Camel Bell on Silk Road International Photo Festival in Tongliao, Inner Mongolia, China. From August 20-September 9, 2018 I had three works from a brand new component of my In the Air project called Smoke Signals on display at Design on Main, 203 Main Street, Ames, Iowa. The work was created to mimic images from the 1971-77 Documerica Project and is in response to recent moves by the Environmental Protection Agency (EPA) to delay or roll back regulations created to protect our health. 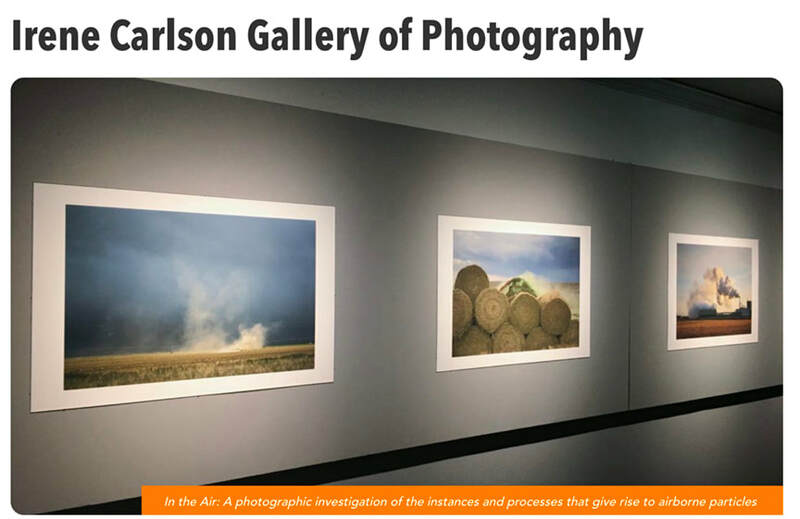 Earlier this year one of my In the Air images made it into the Allegany National Photographic Competition and Exhibition, juried by Karen Irvine, Deputy Director & Chief Curator, Museum of Contemporary Photography, Columbia College Chicago and won 2nd place in the color category! In April, Bloomberg Businessweek contacted me to photograph a farm for a story. It was a long winter this year, so nothing was growing yet. However, I got to experience a ride in a giant tractor! Earlier this year I participated in Common Channel: Responses to Ledges State Park in which faculty from Iowa State made work for a group exhibition in response to Ledges State Park near Boone, IA. The exhibition was held at the Boone Historical Society and an artist talk was held on April 20. For this project I was thinking about the park at night when the sounds of humans recede and the sounds of the park become more prominent. I created four images that were photographed at night to highlight the park in repose, not inhabited by humans nor lit by the sun. 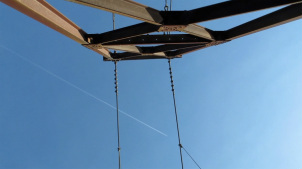 I participated in an artist residency at ﻿Jentel﻿ in Wyoming where I photographed and edited my In the Air project. It was a wonderful experience and I thank everyone involved! ​Honored to be included in the August 2016 issue of Harper's Magazine with poetry by John Ashbery! 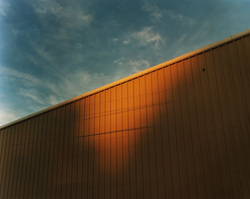 ​An image from my Vapor project was included in the Manifest International Photography Annual 3. ​pursue a new photography project! One of my images from the Vapor series was selected for the 2015 Joyce Elaine Grant Photography Exhibit, juried by April Watson, Curator of Photography at the Nelson-Atkins Museum of Art. Thank you! A big thank you to ﻿﻿Margaret﻿﻿ Adams for curating my work into an exhibition on fototazo! by Jordan Weber of Fluxx Collective and was projected in the front window during the opening. 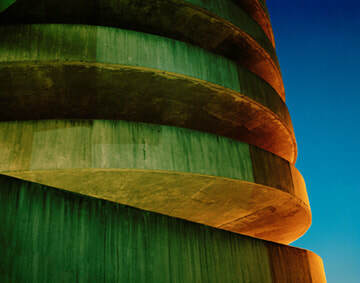 One of my images was included in the FlakPhoto Midwest Print Show, curated by Andy Adams. I was offered a position teaching photography at Iowa State University! My Monolith project will be exhibited at the Kiernan Gallery in May!! A big thank you to Freddy Martinez for including me on his PhotoWhoa blog and for his incredibly thoughtful questions. 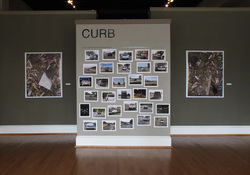 This year for the Marginal Arts Festival in Roanoke, Virginia, I created a project about cigarette debris called CURB. 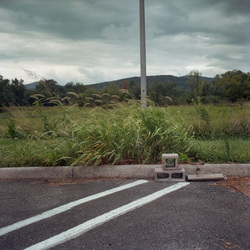 Wanderlust was included in the Time Together show at the Brown Center in Baltimore, Maryland during the Society for Photographic Education Conference. Thirteen images from the Nothing But project were included in the Home Sweet Home exhibition at the Eleanor D. Wilson Museum. The full length version of Wanderlust was screened in a programming event during the Home Sweet Home exhibition at the Eleanor D. Wilson Museum. Delighted to be invited to be part of Photo Eye's Art Photo Index!! My Wanderlust video will be screened with Roelof Bakker's London version of Wanderlust at the Meantime Project Space in Cheltenham, England! 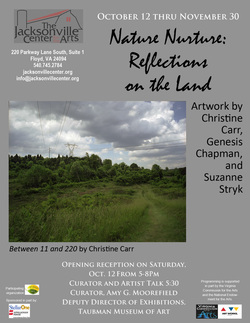 Delighted to be a part of this exhibition at the Jacksonville Center for the Arts in Floyd, Virginia! 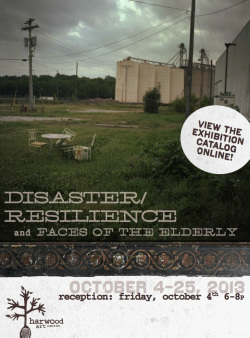 I'm honored to be included in this exhibition at the Harwood Art Center in Albuquerque, New Mexico. "Disaster/Resilience marks Harwood Art Center’s 4th annual exhibition dedicated to the artistic exploration of contemporary social justice issues. This year’s program features fifteen international artists selected through a competitive jury process; their works offer rich and diverse reflections upon identity, place, politics, relationships and transformation." Jason Eppink, the Associate Curator of Digital Media at the Museum of the Moving Image in New York juried my short version of the Wanderlust film into the Washington Project for the Arts Experimental Media Video Screening Series. It was a pleasure to meet Jason and the attending artists at the screening! This image from my Nothing But series was included in the Online Gallery Annex for the City Streets/Country Roads exhibition juried by Rebecca Norris Webb and Alex Webb. 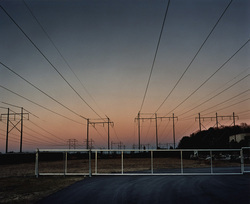 This image was one of two included in the On-Line Annex Exhibition called Field Notes: Landscape and Architecture. 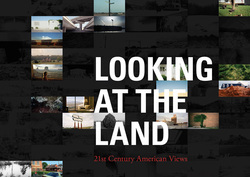 My image in the Looking at the Land exhibition was one of twenty selected to be included in the FotoWeek DC exhibition of Looking at the Land: 21st Century American Views. On Friday, September 28, one of my images was featured on Flak Photo as part of its ongoing Collection series. 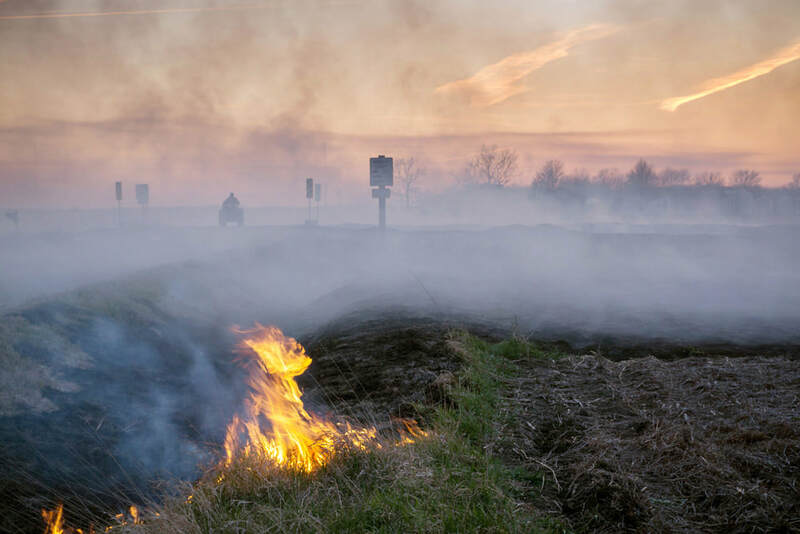 I am honored and very excited to be included in the Flak Photo project Looking at the Land - 21st Century Views, a collaboration with the Museum of Art, Rhode Island School of Design. and included my image in the article. The PHOTO/arts Magazine, PetaPixel and ALTFoto blogs included my image as part of their articles about the Looking at the Land exhibition. 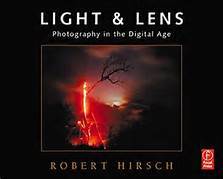 I am absolutely delighted that one of my images was included in the most recent edition of Light and Lens by Robert Hirsch!! If you find yourself flipping through the book, please stop by page 145 for a visit. 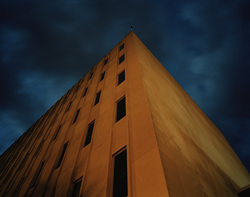 One of my Monolith images was exhibited at The Kiernan Gallery in Lexington, Virginia as part of the Between Dusk and Dawn exhibit that ran from May 8-June 2. Two of my images from the Nothing But series were accepted into Focal Point at the Maryland Federation of Art in Annapolis, Maryland. The exhibition ran from May 25-June 17. Prairie Center of the Arts in Peoria, Illinois! 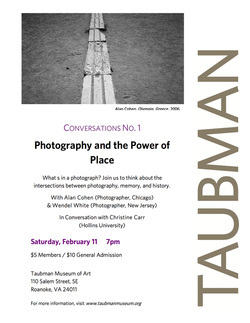 I was invited to be the moderator for the Saturday, February 11 Conversations series at the Taubman Museum of Art, featuring Alan Cohen and Wendel White. I am shooting video every day for the Southwest Virginia counterpart to Roelof Bakker's Wanderlust, created in London during 2011. 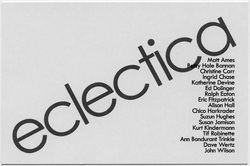 Eclectica exhibit at the Walker Fine Art Gallery in Martinsville, VA from January 17-February 23. 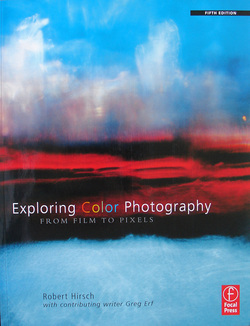 From Film to Pixels, 5th edition, by Robert Hirsch!! William King Museum in Abingdon, VA. Gave a lecture with Amy Moorefield at Piedmont Arts in Martinsville, VA for The Fleeting Glimpse exhibition. 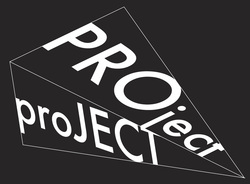 Co-organized PROject proJECT, a one night outdoor event of light and projection based art in Roanoke, VA. It included over 20 artists and attracted over 500 visitors. 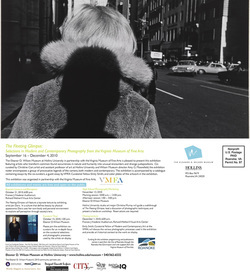 Co-curator with Amy Moorefield, Director of the Eleanor D. Wilson Museum at Hollins University, of The Fleeting Glimpse: Selections in Modern and Contemporary Photography from the Virginia Museum of Fine Arts. 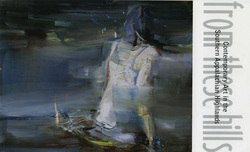 The show began at the Wilson Museum at Hollins and is being exhibited at the Virginia Museum of Fine Arts in Richmond, Virginia. The dates there are January 15, 2011-April 03, 2011. 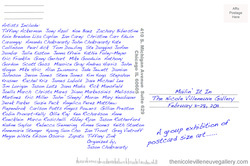 Three small versions of images from my Monolith project were included in the show Mailin' It In, curated by Jason Chakravarty and exhibited at The Nicole Villeneuve Gallery in Chicago from February 11-28, 2011.
at the beginning of March, 2011. Awarded an honorable mention in the Black and White show at the Mpls Photo Center in Minneapolis, Minnesota, juror George Slade. Invited to exhibit in Shoot'n Southern: Women Photographers Past and Present at the Mobile Museum of Art in Mobile, Alabama. 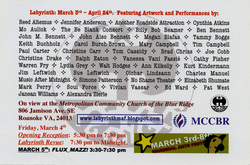 Invited to exhibit in a show called Abstract By Design at the Jennifer Schwartz Gallery in Atlanta, Georgia. Had a solo exhibition of the Portal project at the O. Winston Link Museum in Roanoke, Virginia. Was awarded a Grants for Artists Program Award from The Arts Council of the Blue Ridge. Thank you!! Last, but not least, I was awarded a two week residency at the Kimmel Harding Nelson Center for the Arts in Nebraska City, Nebraska. It was a wonderful experience and I thank everyone involved.